I've always considered Lee Lorenz more of a "Cartoons In The Key Of The New Yorker" cartoonist rather than one of that hallowed magazine's groundbreaking talents or innovators. Rather than forging some unique artistic path of his own (Steinberg, Steig), or connecting in some way with the zeitgeist of an era (Arno, Chast), or simply making astounding-looking and sublimely funny cartoons with rigorous consistency (Addams), Lorenz has through his 1500-plus cartoons seemed content to mine more standard-gag material, especially areas of interest that would seem to bear the magazine's collective imprimatur. 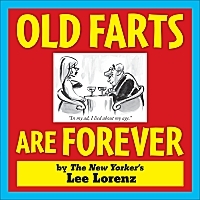 Old Farts Are Forever collects a bunch of Lorenz cartoons on the famously stuffy, dour, angry and entitled New Yorker Old Man, who exists somewhere between the terrifying, surviving members of the previous generation with whom that magazine's reader must deal and a funhouse mirror version of what one might think New Yorker readers are like. A lot of the humor in Lorenz's gags comes from the world-beating confidence of one of the men in doing something unnecessarily rude or upsetting, something that violates even the captain of the universe standards he's set for himself. The humor in most of those strips comes from the bizarre nature of the affront (a man telling his wife the buxom twenty-something is at their door "only" for a sleepover) or the delight in which the patrician takes in indulging himself. "I'm not ordering any lunch, Caswell," says one awful looking older white man in a series of them, "I'm going to eat yours." The remainder of the cartoons are made up of more generic old man and culture clash cartoons, but they're not as successful as the one focused on a specific hateful breed. This is a fine little batch of effectively-done cartoons if certainly not anything close to one for the ages.